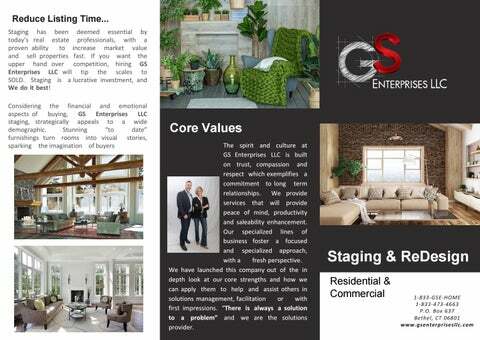 Core Values The spirit and culture at GS Enterprises LLC is built on trust, compassion and respect which exemplifies a commitment to long term relationships. We provide services that will provide peace of mind, productivity and saleability enhancement. Our specialized lines of business foster a focused and specialized approach, with a fresh perspective. 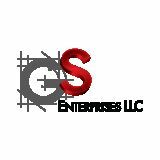 We have launched this company out of the in depth look at our core strengths and how we can apply them to help and assist others in solutions management, facilitation or with first impressions. “There is always a solution to a problem” and we are the solutions provider. Kitchen, Bath, Basement, Bedroom & Living Room Redesign - Just pick a room and we’ll make it beautiful! Holiday Decor Design - Need help preparing your home for a special event or for the holiday season? We can provide decor services that will transform your home into a wonderland. First Impressions... With experience in both the real estate industry and landscape design, we know just how off putting a landscape can be if not properly maintained, which is why we can also amp up your curb appeal. Our landscape services can be provided as part of your staging and re-design service. If you’re tired of your current home decor or just unsatisfied with your own design attempts, we specialize in making rooms beautiful so let us be your Style Specialists! From window treatments, accessories, paint colors and hardware, we’re here to guide you through the beautification process making sure to capture your personality throughout each room we redesign.